Home picture of the day Water in Stars? 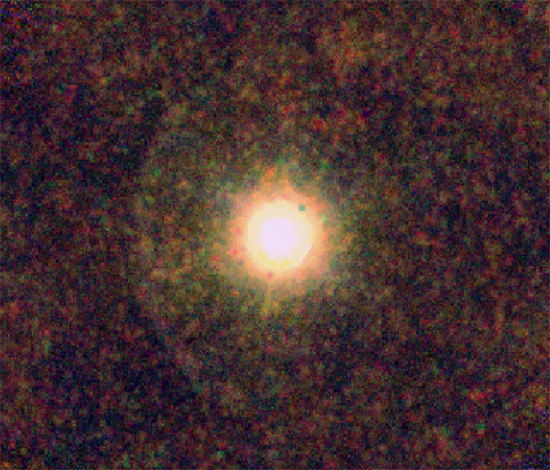 Image of CW Leonis, also known as IRC +10216, was obtained with the SPIRE and PACS instruments on the Herschel Space Observatory. It combines observations at wavelengths of 160 µm (blue; PACS), 250 µm (green; SPIRE) and 350 µm (red; SPIRE). Astronomers using the Herschel infrared space observatory discovered a putative cloud of hot water surrounding a giant star in the constellation Leo known as IRC+10216. They were also puzzled by the discovery of water near other carbon stars, but the Herschel team thinks they know what creates it: ultraviolet light. As a European Space Agency bulletin states, “It is the only explanation for why a dying star is surrounded by a gigantic cloud of hot water vapour.” Supposedly, ultraviolet light from nearby stars penetrates the envelope between gaseous “clumps,” breaking apart carbon monoxide and silicon monoxide, allowing oxygen and hydrogen atoms to attach, forming water. IRC+10216 is a red giant star, surrounded by a massive cloud of dust that absorbs most visible light. The only way to “see through” the dust barrier is with infrared detectors. It is in that dust that the water vapor was found. The “clumpy structure” in the dust around the star is said to contribute to the formation of the water. In an Electric Universe, stars are electromagnetically and externally powered. A star is the locus of electric charges that circulate through the galaxy along star-spanning filaments known as Birkeland currents. A red giant is a star lacking a photosphere, the “surface” from which main sequence stars emit radiation. In the case of IRC+10216, its chromosphere has expanded in order to meet the red giant’s electrical needs. Stars shine because electricity flows through each galaxy. As has been written in these pages many times, stars can be thought of as giant spheres of slow-motion lightning. It is this simple hypothesis that best matches observational evidence. Any fusion takes place on the surface of an electric star and not “deep in its core.” Molecular oxygen can be created in electrically intense outer layers of a star. The primary indicator for a star’s behavior is the current density at its surface. Stars do not rely on internally generated fusion fires to supply them with energy. A relatively cool atmosphere exists beneath the chromosphere of a red giant, so larger and more complex molecules can exist there. The molecular oxygen and the carbon atoms around IRC+10216 are created in the star’s atmosphere because an electric field accelerates electrons toward the star. The same field accelerates positive ions in the opposite direction. That’s why these cool stars have unexpected massive stellar winds. Electric stars form by Marklund convection, so they do not possess cores of compressed hydrogen. Heavy elements, including carbon, collect in their cores. Relying on the remote ultraviolet emanations from other stars penetrating the obscuring clouds of dust because they are “clumpy” misses the point of electrical activity there.